stakes | Stavros Halvatzis Ph.D.
What are the Stakes for your Hero? The stakes could not be higher in Deliverence. What are the stakes for you hero? In Making a Good Script Great, Linda Seger points out that studio executives, producers and story editors are fond of asking this question of every writer. The answer to this question can make or break a story. If the risks are weak or unclear, readers and audiences have no reason to care about the characters in our story or see any connection between their experience and the experience of our fictional characters — our characters will not evoke a sense of empathy. Abraham Maslow devised a seven-part hierarchy to explain what drives us as people, and what the stakes are if we fail to get what we need or seek. 1. Survival: Many excellent stories are about survival. This primal instinct is basic to all animals and we are no exception. By centering our story around the hero’s (or community’s) survival, we’re ticking the first box on the list of creating empathy. 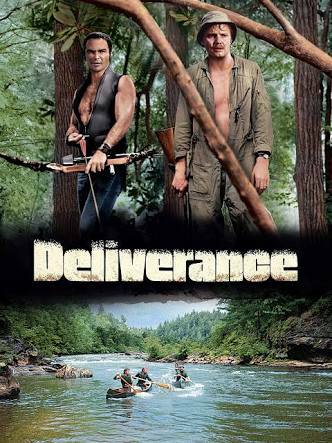 The movie, Deliverance, is a fine example of this. 2. Safety and Security; Once our survival needs are met, we seek a safe and secure place to keep the dangers at bay. We lock our doors, build forts, raise armies to guard us. Voyage of the Damned and Country utilise this need in their stories. 3. Love and Belonging: But what is a safe home without love and family? We have a deep need to connect with others. We need to love and be loved in return. In Places of the Heart, Edna desperately wants to preserve her family — a family that comprises of more than just her children. It includes Will, the blind man, and Moses, a black male. This need drives the story to its inevitable conclusion. 4. Esteem and Self-Respect: People desire to be looked up to, respected. But this respect has to be earned through knowledge and hard-knocks. Luke Skywalker earns respect at the end of Star Wars after a series of lessons learnt the hard way. 5. The Need to Know and Understand. We are insatiably curious creatures. We seek to understand how things work, how they fit together. We seek to know what life is, where we came from. Mary Shelley’s Frankenstein is driven, in part, by such a curiosity, while films such as Back to the Future and The Time Machine show characters perpetually struggling to understand how to travel back and forth in time. 6. The Aesthetic: Once we are secure and confident, we seek to create a sense of order in our lives by connecting to something higher than ourselves. This can be a religious or aesthetic experience, but it often involves the search for epiphany. Films such as Joan of Arc, Amadeus, and Never Cry Wolf, use this more abstract need to drive their stories. 7. Self-Actualisation: Finally, we need to express ourselves — to communicate who we are, to declare our skills and talents to ourselves and the world. Artists and athletes express this need through their desire to finish a work, break a record. The need to excel is strongly displayed in films such as Chariots of Fire and The Turning Point. Used in combination these needs, instincts and desires form the backbone of many successful stories. They create empathy in readers and audiences, linking their own desires to the dreams, hopes and fears of fictional characters. Use Maslow’s hierarchy to help you establish the stakes for your story‘s fictional characters to motivates their actions and experiences. This entry was posted in On Character, Story Design and tagged amwriting, hero, Ian1, novel, novelist, screenwriter, stakes, writer, writetip on October 14, 2018 by Stavros Halvatzis.